I was surprised to see Andrew Daddo on Ten's 9am, with David Reyne and Kim Watkins. I never imagined that his Aussie fellawas such a tender hearted Dad. I bought this book at the first opportunity from that interview laughed at my own recollection of my folks calling me 'Little Miss Independent', yes I really can remember. My brother was born when I was just 2 years and 10 months, I remember being at the hospital and rubbing his cheek! The real beauty in the book is the love Andrew has for his daughters independence, I don't know that he will enjoy it when his daughter is fourteen! I always feel for Dad's with little girls, there is such a great love between a Dad and his little girl - then she becomes a teenager "Arhh, Whatever!" There's nothing she can't do. If you say, "Would you like me to help you into the car?" 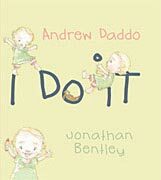 She says, "I do it"
This charming picture book for the very young perfectly captures a child's determination to be independent - at all costs. Andrew Daddo's beautiful story, coupled with Jonathan Bentley's delightful illustrations, will touch the hearts of all. Andrew Daddo has written thirteen books for children, all of them have been enormous successes. When Andrew isn't writing or enjoying family life, he is one of Australia's most popular television personalities, currently working on 'The Great Outdoors' Andrew lives in Sydney's northern beaches with his wife and three children. Jonathan Bentley lives in Queensland with his partner and two children. He worked as a freelance illustrator for 12 years in England and Australia before joining the Courier Mail as an editorial illustrator. Review: Every parent can relate to this book and children will love it's fun and cheeky nature.